GCCThe race is on to find economical uses for the rich bonanzas of methane being unleashed globally by North American practises of horizontal drilling and various types of fracturing tight shale gas formations. Both gas-to-liquids (GTL) and LNG are being proposed and developed to extend the economic reach of methane deposits -- many of which may be stranded far from lucrative markets. Carbon Sciences Inc. has developed a catalyst which it claims will make the process of dry (CO2 reforming, #2 above) reforming of methane to syngas more profitable. From high quality syngas, any number of high value chemicals or liquid fuels can be produced. The UOS catalyst technology, developed over the past decade by Dr. Hui Wang, professor of Chemical Engineering, has demonstrated high performance and reliability. The UOS catalyst achieved 92% conversion into essentially 1:1 H2/CO syngas with no detectable sintering, no significant carbon deposition, and thus no catalyst deactivation. Dr. Wang’s research team has successfully tested the catalyst for 2,000 hours of continuous operation in a bench top reactor. The catalyst has also undergone 600 hours of commercial testing without regeneration. The company claims that its second-generation catalyst has achieved performance levels close to its theoretical limits. After achieving very positive commercial test results for our catalyst, we are moving ahead aggressively to accelerate the production of larger quantities of the catalyst, as well as completing the technical and economic analyses in preparation for discussions with strategic partners. Working with the GTL experts at our engineering firm, Emerging Fuels Technology, we also plan to demonstrate an end-to-end process that will produce samples of diesel fuel that can be used by existing diesel vehicles. 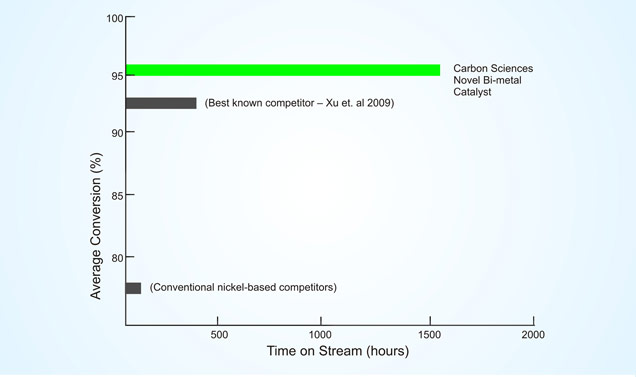 ...Carbon Sciences’ claims that using its catalyst can achieve a 20% to 30% capital cost advantage over the alternatives because dry reforming is a simpler process, does not require an oxygen plant, uses small amounts of steam and has high conversion efficiency. Additionally, the feedstock cost of dry reforming syngas may be lowered by as much as 25% because CO2 is a zero cost feedstock (and often negative value) that occurs naturally in methane gas fields. In situations where plentiful CO2 is freely available, the dry reforming method may well offer several advantages, and Carbon Sciences Inc.'s new catalyst may find itself a very lucrative niche in the brave new world of synthetic liquid hydrocarbons and high value chemicals. But in the long run, better catalysts will lead to GTL processes which will bypass the energy-intensive gasification stage. It is commonly known that micro-organisms break down hydrocarbons in the environment to methane. Other micro-organisms have enzymes which perform reverse, synthesis reactions to create medium and longer chain hydrocarbons. It is these lower temperature synthesis reactions which will win out in the end, probably using robust biomimetic inorganic nano-catalysis. While humans will eventually move away from hydrocarbon fuels, they will likely be using hydrocarbon based chemicals and plastics for many centuries to come.